Loch Ness is certainly high profile - but is this famous location worth visiting? That’s a question to weigh up when you plan your itinerary. After all, Loch Ness, thanks to its modern monster myth that dates from 1933, pretty much has iconic status. Even folk who know next to nothing about Scotland have probably heard of the Loch Ness Monster. And even Google Maps uses a wee green monster symbol instead of the ‘yellow figure’ should you go to Street View. (At least it did the last time I looked.) So the monster phenomenon is pretty famous, right? Will you see the Loch Ness Monster, if you visit the loch? No. So, in a strict sense, if you've set your heart on seeing a monster, then Loch Ness won't be worth visiting. However, this is not the same as saying you won’t see anything. You might see a floating log, a boat wake, a swimming red deer, a family of otters, a cormorant fishing or any number of other things that you may prefer to interpret as a monster, so strong is the myth of Loch Ness. Should you spend time at Loch Ness anyway? Well, it’s OK - it’s quite attractive but there are even more scenic places in Scotland. Make no mistake, the monster is big business and attracts a lot of promotional funding. Marketing expenditure brings lots of people - and I suppose that explains why we recently saw two visitors (literally) fighting for a parking space at Urquhart Castle in peak season. Most unseemly! To remove any doubt, there us a helpful information board at Dores that confirms you are at Loch Ness. The day is grey and misty and mild - oooh, typical monster weather. only have two days or so in Scotland? The geography, the very shape of Scotland itself, has created for visitors with limited time here a kind of ‘milk run’. I suppose it amounts to ‘seeing the best (perhaps) of Scotland in two days’, or whatever. This map of the Inverness itinerary shows the general layout rather than the individual roads. Basically, it’s a big triangle with Inverness as its most northerly point. This ‘milk-run’ itinerary - familiar territory for every professional tour guide in Scotland! - is basically from Edinburgh (or Glasgow) up the A9 road to the small city of Inverness. Next, it's south-west via - YES -inevitably - Loch Ness and the Great Glen - the coast-to-coast trough or fault-line in which Loch Ness lies. After that comes the town of Fort William, a small commercial centre at the end of the Great Glen that nobody would describe as quaint and scenic even in their most benevolent moments. After that, it’s through very scenic Glen Coe, over Rannoch Moor and back east, either via Loch Lomond to Glasgow or via, say, Callander and the edge of the Trossachs to Edinburgh. In a nutshell, it’s on the map here. Scotland in Two Days? Including Loch Ness? Drive it - or, better, take an organised tour - and, that’s it. You've done Scotland. Including Loch Ness. Hmm. Well, maybe. However, let’s be clear here, if you only have, say, a couple of days, then we have to admit that, keen as we are to get you off the beaten track and see different places, there are worse things to do in Scotland than follow this well-worn route. On these big sweeps at high speed on main roads, you still get a sense of the open space and big skies of the Cairngorms and the Central Highlands on the way up to Inverness via the A9, and staying overnight in Inverness is probably a good idea. Turning south - the second of your two days - you then see the 20 or so miles of Loch Ness and perhaps stop somewhere - Drumnadrochit most likely - to participate in the monster marketing in which the area specialises. How far is Loch Ness from Edinburgh? Well, you can drive from Edinburgh to, say, Drumnadrochit (for Urquhart Castle) via Inverness in about three and a half hours plus your stops - that’s going via the A9. Let’s call ii about 170 miles / 272 km. If you go via Glen Coe and Fort William, which is probably more interesting, then allow about four and a half hours driving time for Drumnadrochit and call it 180 miles /288 km. Urquhart Castle, by Drumnadrochit, has fine views of Loch Ness. Urquhart Castle overlooks Loch Ness and as well as a historic fortress that once guarded the Great Glen, it's also a favourite monster-spotting vantage point. You could say that Loch Ness is worth it in order to visiting this castle, perhaps. Ben Nevis, Scotland’s highest mountain; Glencoe with its soaring, steep mountains and tale of clan treachery; Rannoch Moor, desolate and atmospheric, and, if you end up in Glasgow, Loch Lomond as a kind of scenic bonus. Listed like that you can see why this particular 'milk run' is popular - especially with visitors opting for someone else doing the driving - in short, well-organised package tours. What if you had more than two days to explore Scotland? And yet, and yet...if you only had a little more time! And I mean for either a longer package tour or following an itinerary where you drive yourself. Pleasant enough though the ambience of Loch Ness can be, in these circumstances (ie either spending more than just two or three days in Scotland or operating as an independent traveller) we would say, if not skip entirely, then don’t dally too long in the Great Glen and Loch Ness. Why? Well, the point about the Great Glen - obvious from the map - is that it’s a straight-line diagonal through-route across Scotland: and has been for centuries (hence the need for castles like Urquhart Castle to guard the route in the old feuding days). Without becoming tediously geological, it’s a great big fault line along which the Highlands north of the line have slipped north-eastwards and the rest of Scotland slipped south-westwards over aeons of time (he said vaguely). 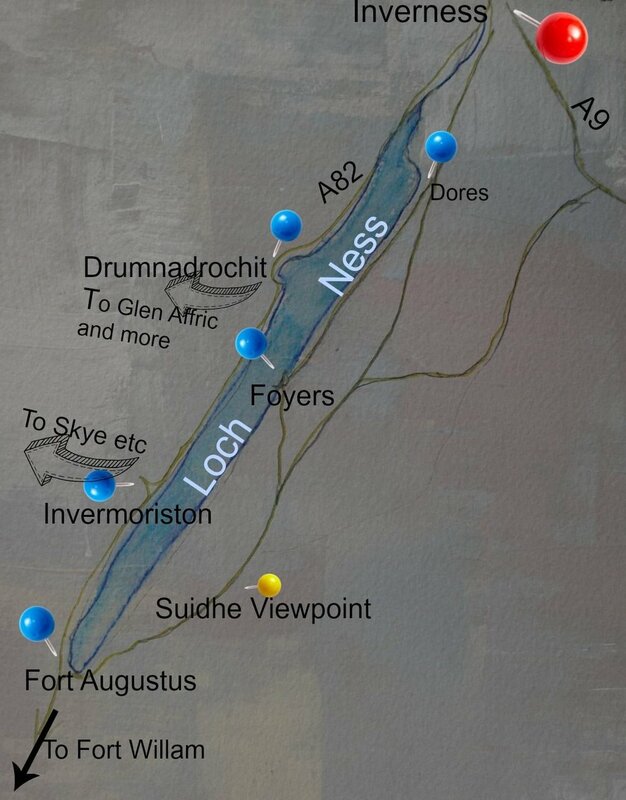 Here’s a bare-bones map of Loch Ness and its position, just a few minutes’ drive below Inverness. Busy road to left, not-so-busy but quite narrow roads to right. So, today, by the nature of the geology, this ancient trough is inevitably where the main routes run - because of the difficulties of the ground on either side. So, the truth is that the Great Glen is actually quite a busy part of the Highlands. Between Inverness and Fort Wi lliam the main A82 road takes plenty of commercial and tourist traffic in both directions, some of it bound for the Isle of Skye. In the main season, frankly, it’s a pretty horrible road from a driving point of view, especially if you are new to driving in Scotland. It's often described as one of the most dangerous roads anywhere in Scotland. That's why we recommend taking a tour if time is limited in the first place. If you are to be a driver here, then keep your eyes off the scenery and do as little overtaking as possible, will you promise me? As it happens, there aren’t that many overtaking places / opportunities anyway, down by Loch Ness and beyond. Looking south towards Loch Lochy at Laggan Locks on the Caledonian Canal - a pleasant escape from the hurly-burly of Great Glen driving. And take lots of breaks, if you are exploring the Great Glen and Loch Ness as driver for a party. Laggan Locks is a good place for a picnic. Fort Augustus usually has something going on on the water - all that opening and closing of lock gates and general watery hubbub plus shops, cafes, nice places to stay and a good view of the loch too. It’s at canal-side places south of Loch Ness that you’ll see for yourself that the Caledonian Canal is busy with leisure traffic too. There are watersports operators and lodges in the woods, walking trails and even a canoe trail - and in the middle of all this sits Loch Ness, with its monster exhibitions and its popular Urquhart Castle and its cruise-boats that on still days create the conflicting wakes with humps that make people think the monster is cruising too. Oh, yes, there’s plenty to do. If you are exploring the loch, then you’ll need an Ordnance Survey map of the area. These are the locks at Fort Augustus at the south end of Loch Ness. There’s usually some boaty activity going on by way of a diversion here. If you want somewhere a little quieter than the A82, then you could try the little roads going down the east side (sometimes referred to as the south side) of Loch Ness. Head for Dores - fiirst loch views - and Foyers, where the Falls of Foyers are definitely worth a look. You are following the route of the 18th-century military roads, built to keep the Highlands in check. Note that none of the soldiers’ records, while they worked on the loch-side road, digging and blasting, mention a monster. At that time, the monster industry had not yet been thought of. Come to think of it, neither had the tourism industry. If continuing south from Foyers on the old military road, that runs up and away from the road, take the greatest care on the first section above Foyers. It’s narrow, with blind bends and great potholes on either side of the road (autumn 2016). However, it’s worth hazarding it, if only to reach the Suidhe Viewpoint. The road has widened a little, and runs in places straight like a Roman road. The viewpoint offers a wide panorama over the Monadliath to the east and other high points beyond Loch Ness to the west. If you want a loch view at the this point though, best to hike along the well-made path that leads on to high ground from the roadside. You get a distant view of Loch Ness to the north-west. The path leads on to the South Loch Ness Trail. Are popular venues in Scotland the best venues? So, is it worth visiting Loch Ness, a main feature in the tourism activities in the Glen? Just because a place is famous doesn’t always mean it’s going to give you the very best experience. And here I return to a theme mentioned in other pages such as the Road to Skye and also my Loch Ness blog piece. Scotland has magnificent scenery in many places. The area around Loch Ness has quite nice scenery. So, you can experience the quite nice stuff if you decide that Loch Ness is worth your time. And, when you’re there, pick up a cuddly Nessie toy or some other kind of souvenir. But where...if not Loch Ness? However, you can see the magnificent bits if you decide to include (or select from): Glen Affric, close to the Great Glen; Glen Shiel on the road to Skye; Torridon and Applecross; the seaboard north of Ullapool; Knoydart; even, east of the Great Glen, Strathspey (Spey Valley in its anglicised form); Upper Deeside; even the Angus Glens, if you want silence and the place to yourself. Some of these are on our page about off the beaten track places in Scotland. Then there are the Scottish islands if you want grand seascapes as well as mountains - the list, of course, starting with the Isle of Skye and also Mull. What about visiting, say, Orkney? By the way, for that matter, would I rather spend a day on Orkney or a day on the shores of Loch Ness? I’d choose Orkney every time. So, to conclude, the advantage of visiting some of these other places on this list is that you may not have that sense of being hemmed in along the glen - or, at least, that’s what I always feel when I travel along the Great Glen. And, certainly in the case of travel destinations like the islands of Orkney for example, you should have a genuine culture and community identity. Along Loch Ness-side, pleasant though it is, the attraction there is really based on the make-believe, on the exploitation of an old press story that got out of control in 1933 and has remained so ever since. Without Nessie, Loch Ness would just be a pleasant loch on the way to somewhere even more scenic. Finally, as alluded to above, because the main lines of communication are carried in the big trough of the Great Glen, personally I always find trips along Loch Ness and southwards to be slightly claustrophobic, to be honest. You can’t see out of the trough - and that’s why it’s always a relief to, say, turn off at Invergarry for the road to Skye where there are views like this (pictured) which give a real sense of space and openness. By the way, the chain of lochs - Ness, Oich and Lochy - that lie along the fault line, of which Loch Ness is the best known, were linked by the Caledonian Canal in the early 19th century. Though originally conceived for commercial and even military purposes, the Canal is mostly used by leisure craft today. The Great Glen area was meant to benefit from a railway later in the 19th century as well - but the rivalry between competing railway companies put paid to this. Basically, the then Highland Railway was entrenched in Inverness, having got there via Perth and also, ultimately, via the east, and did not want any other line to sneak up on it via the Great Glen. From Spean Bridge near Fort William the little Invergarry and Fort Augustus Railway opened in 1903 but its intention of eventually reaching Inverness was doomed from the start, mainly because of the powerful interests of its rival. Discover even more of Scotland here. Include as many of these must see places in your Scottish trip planning. They have the 'wow' factor and there's a great selection. Some, like Stirling Castle or Loch Lomond, are easy to plan round; others, such as Skara Brae or the Isle of Eriskay, take a bit more itinerary juggling but are worth the effort.